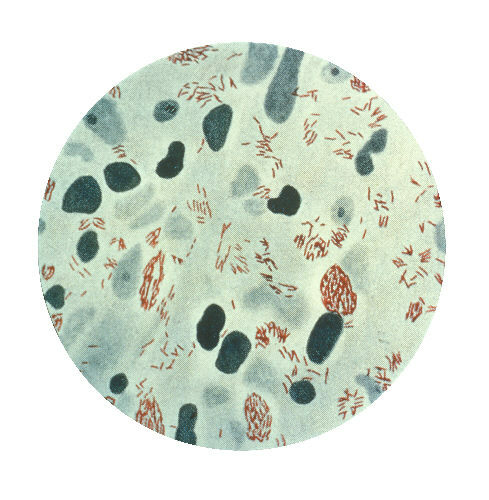 Mycobacterium leprae is quite an interesting bug. It is significantly related to M. tuberculosis (the causative agent of TB), yet leprosy is a very different illness. Unlike other mycobacteria, M. leprae is unique in the fact that it is an obligate intracellular parasite. Replication of the bacterium cannot occur outside of host cells. To date, no synthetic media has been able to support M. leprae replication. Since M. leprae is required to parasitize, it stands to reason that discovering the genetic components of this lifestyle will provide possible venues for drug therapy against this debilitating illness. It is clear that M. leprae is closely related to the other mycobacteria, this paperby Cole et al. analyzes the genetic sequence of M. leprae and compares it to M. tuberculosis. By doing this, we have the potential to deduce how M. leprae has evolved and which genes are essential for mycobacterial replication outside of host cells. One of the first things we see is that M. leprae has a 1.6Mbp SMALLER genome than M. tb. (~3.2Mbp and ~4.4Mbp, respectively). Of this much smaller genome in M. leprae, only about 50% of it contains protein coding genes (compared to 90% in M. tb.). The rest of the M. leprae genome is 27% recognizable pseudogenes (with a number of 1,116 compared to only 6 pseudogenes in M. tb. ) and 23% non-coding sequence (possibly as regulatory elements or genes mutated beyond recognition). Clearly there has been a tremendous amount of downsizing in the M. leprae genome. The large loss of sequence, along with the large amount of pseudogenes, the low number of protein coding genes, and the huge amount of non-coding sequence all indicate that M. leprae has undergone a clear and classical example of reductive evolution. The authors go into much specificity about which genes and pathways have been lost in M. leprae compared to M. tb. One highlight is that the central metabolism of M. leprae is much different than in other mycobacteria because of a variety of gene losses. M. leprae can not utilize acetate or galactose as a carbon source. Also, it has lost all enzymes needed to function in an anaerobic or microaerophilic environment. Even it’s aerobic electron transport chain has been truncated—indicating that it can not produce ATP from NADH, and it needs to rely on low energy gain pathways to recycle its reducing equivalents. In looking at virulence genes, the authors found only one a laminin-binding protein which may cause a tropism for myelin-producing cells (which M. leprae has). However, M. tb. also has this gene, so it’s purpose is not yet known. M. leprae also has a handful of genes that are not present in M. tb., including eukaryotic like adenylate cyclase and uridine phosphorylase. Also, two transport systems an ABC sugar transporter and a unique divalent metal ion transport system. I am interested to see how this study affects future drug development for anti-leprosy drugs. Also, this study should help M. tb. researchers, due to the fact that essential genes are likely conserved in these two species. With the advent of MDR and XDR-strains of M. tb. and the persistence of M. leprae in our population, it is imperative that new methods of treatment be developed.